Choosing a to wear a pinstripe suit is choosing to wear a very personalized style statement. When it comes to suit fashion, nothing more clearly says, “notice me”, than that of a man dressed in a pinstripe suit. Choosing a pinstripe suit style however is not and easy challenge, paling in comparison to choosing a solid colour suit. a pinstripe suit is a sign that a man’s wardrobe has matured to a new level. 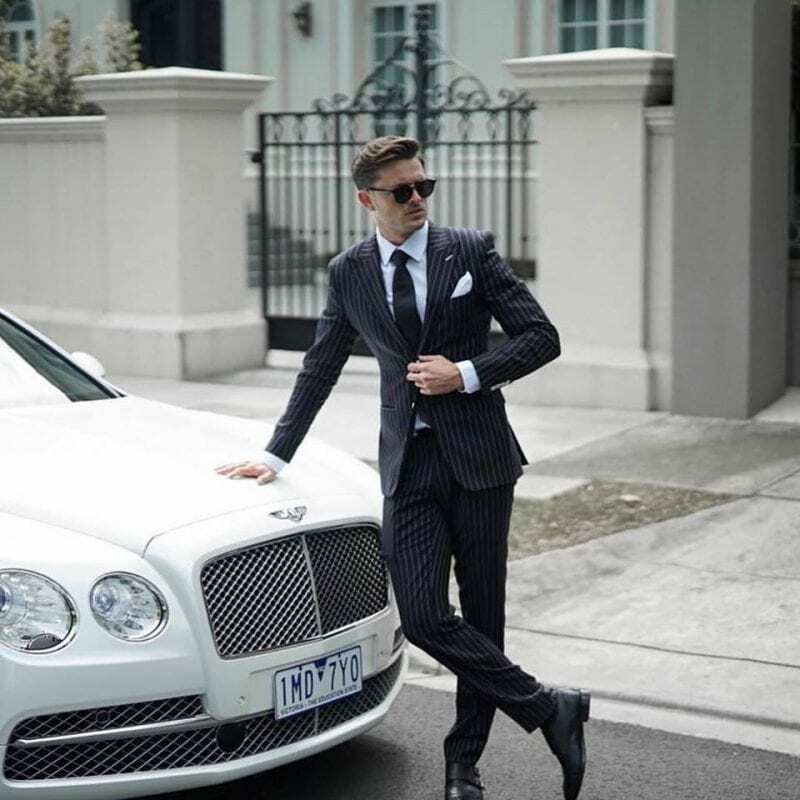 Your first suit is never a pinstripe suit. It’s often purchased by a man once he reaches his pivotal coming-of-age professional status, just after University or perhaps as he prepares to be married. Whatever the case, it’s use should never be applied as everyday 9-5 attire. Reserving your pinstripe suit for special events and occasions, especially those focused on your career as professional, reserves the pinstripe suit’s impact and magic for the moments you want to specifically standout. choosing the right colour of any suit to compliment your skin tone is by far one of the best starting points when choosing a new suit. When it comes to choosing a pinstripe suit, you’re essentially making two decisions, it’s either a dark suit with light stripes or a light suit with dark stripes. A navy pinstripe suit with light stripes is a popular combination that works with many skin tones and is an option we will often recommend to our clients. the width of the stripes is the next important decision to make when deciding what kind of pinstripe suit style works best with your body type. Consider your shape, are you tall and thin? If so, you may want to stick to a wider stripe which helps give a little more breadth to your build. If you consider yourself shorter and broader, you’re going to want your stripes a bit closer together to help elongate your frame. it goes without saying that any suit, pinstripe or not, is always best when custom tailored to your body. Your suit needs to fit you like a glove and when you add in the optical illusion a pinstripe suit can provide (like those previously explained in our last point) you’re going to want to make sure you have a skilled tailor who keeps the goal in mind of altering your suit so that all your stripes stay headed in the right direction! finally, and perhaps the most fun part of designing your pinstripe suit, is styling it with all the accessories that best define your personality. There are ties, knots, cufflinks, colours, patterns, pocket squares, and the list goes on. All to be considered to compliment your pinstripe suit. Make it flashy or keep it traditional, that part is up to you. With the guidance of one of our experts, we guarantee you will love your new pinstripe suit. Visit one of our showrooms, contact us online or by calling 03 8821 4168 to schedule one of our travelling tailors to come to you. In the meantime, check out our recent article, The 5 Benefits of Tailor Made Suits. An excellent complement of information to our above-mentioned recommendations on choosing your perfect pinstripe suit style. This entry was posted in Blog and tagged Navy Pinstripe Suit, Perfect Pinstripe Suit Style, Pinstripe Men’s Suit.